Cheats, tips, news, and more! 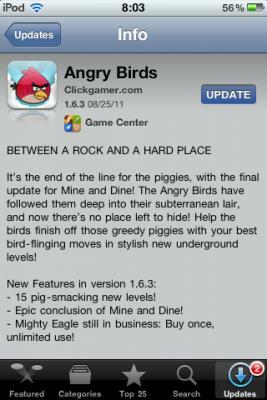 Angry Birds version 1.6.3 was released in August 24, 2011. The final update for Mine and Dine was released in this this version. There is a total of 15 new levels added in this update. – 15 pig-smacking new levels! – Epic conclusion of Mine and Dine! – Mighty Eagle still in business: Buy once, unlimited use! Just as before, you will be able to buy the Might Eagle. The price varies with currency, and you will be able to use it once per hour.